The purchase of the original PC 3D graphics card maker 3dfx by NVidia several years ago seemed to result in a hybrid technology that often made NVidia graphics chips somewhat more unwieldy and inelegant when compared with ATI chips. The original GeForce FX 5800/5900 series cards in particular seemed bulky, hot, noisy and somewhat underpowered for their price range. But the new GeForce 6 series is a different story. These newer chips are both fast and elegant. The culmination of the marriage between 3dfx and NVidia technology has surfaced with the GeForce 6 line of PCI-express cards in the form of SLI, or Scalable Link Interface. 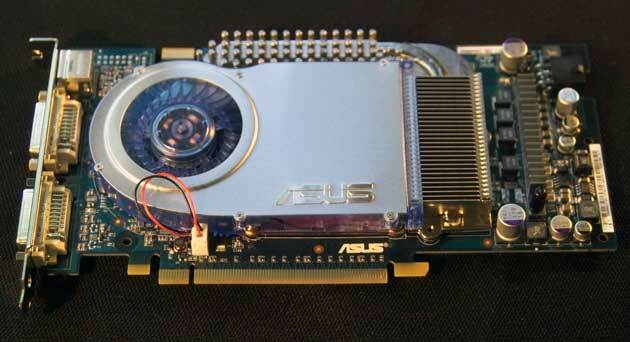 This technology began with the 3dfx Voodoo2 line of video cards 6 or 7 years ago. Back then the technology was known as Scan Line Interleave (SLI), and operated in a similar fashion to the current SLI, by having each of two video cards render alternate lines of the video image. I am going to take a quick look at what NVidia calls its “performance” line of SLI cards (6600GT series) and its “enthusiast” line of SLI cards (6800GT and Ultra series). The biggest difference between the two series is the memory interface. The 6600 series has a 128-bit interface, whereas the 6800 series has a 256-bit interface. Both use DDR3 graphics memory (in GT or Ultra models), but they are based on different graphics chips. The 6600 models (NV43 chip) are based on a 0.11 micron manufacturing process, whereas the 6800 models (NV40 chip) are based on a 0.13 micron process. The 6800 series has 16 pixel pipelines, whereas the 6600 series has only 8 pipelines. This will turn out to have a major impact on the benchmarks. 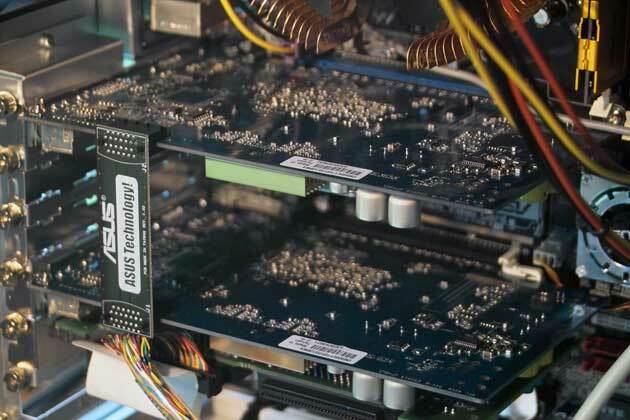 Currently, ATI is working on their own "catch-up" version of SLI which they call "Crossbow". While early benchmarks look great, ATI has a ways to go before they get their dual-card setup to market. For the time being, NVidia rules the high-end of the PC video gaming market. Taking a look at the cards I tested from Asus, it is clear that they are very different beasts. The N6800GT cards have a power connector at the back edge, whereas the N6600GT cards do not. The 6800 cards are also substantially larger and heavier, and will take up quite a bit of space in your system. To purchase two of these cards you are going to have to fork over some substantial cash, about $500 for 2 of the N6600GT cards, and about $800 for 2 N6800GT cards. And of course you’ll need an SLI-capable motherboard with 2 PCI-express graphics slots. For this round of testing, I am using the Asus A8N-SLI Deluxe motherboard. NOTE: The Antec P160 enclosure is a very nice case, but the placement of the first PCI-e slot on the A8N-SLI motherboard is such that the DVI connector on the primary 6800 card is partly obscured by a portion of the case. Many PC enclosures will not have this problem, but some will make for a tight fit when you try to connect your monitor to the primary video card. Just looking at the MHz numbers on the contenders, you might think that the 6800GT cards would be underpowered. You would be wrong. Due to the 256-bit memory interface, and the 16 pixel pipelines per card, the SLI 6800GT setup has enormous parallel processing capacity and bandwidth. So the slower clock speeds as compared with the 6600GT cards are deceiving. Both cards are single-slot designs, and have reasonably-sized heat sinks and fans. Installing the two cards was relatively simple. The only difference is that the 6800 cards need to be hooked to the power supply, and they use power cable adapters that come with the cards. The 6800GT cards have two DVI outputs on the back, whereas the 6600GT cards have one DVI and one 15-pin VGA connector. SLI motherboards come with a special SLI connector that goes from one GeForce card to the other, as you can see in the picture below. Also, on the Asus A8N-SLI Deluxe motherboard, there is a small two-edged circuit board between the two PCI-e slots that needs to be installed one way for a single PCI-express card, and the other way for a dual-card SLI setup. When you first start up Windows after installing the NVidia drivers, it will detect the SLI configuration and ask you if you want to enable SLI. This feature can be turned on and off in NVidia's driver setup menu. I tested these with 1) optimal conditions (trilinear filtering and no antialiasing) 2) 16x anisotropic filtering and no AA, and 3) 16x anisotropic filtering plus 4x AA. In the default configuration, the 6800GT SLI setup almost topped 20,000 3D Marks (2003) at 1024x768 32-bit, which is an exceptionally good score. The 6600GT SLI setup at default values achieved a very respectable 15,000 3D Marks at the benchmark's default settings. This easily beat the 6800 Ultra card in an 8x AGP slot. Notice how the light blue bars (6600GT-SLI) with 16x anisotropic filtering and 4x AA is lower than the single AGP 6800-Ultra score (brown bars). At 1600x1200 with 4 x AA the 6600GT cards ran out of memory. So while it is obvious that the 6600GT cards offer some decent performance at lower resolutions when AA (antialiasing) is disabled, they become almost worthless at high resolution with AA enabled. Next, I took a look at DirectX 8/9 performance in 3D Mark 2005, a benchmark known for its brutal assessment of video card performance. The stand-alone AGP 6800-Ultra card gets a score of a little over 5000, which isn't too bad. 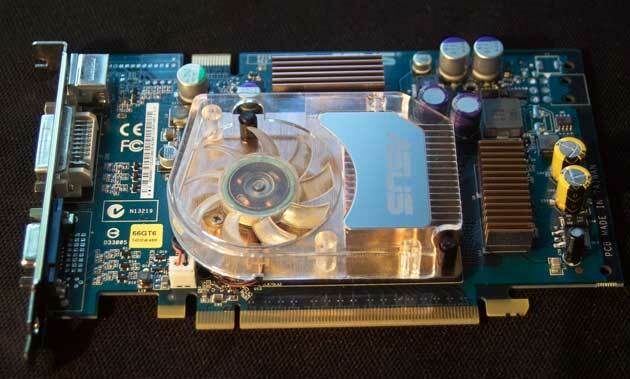 The 6600GT SLI setup got over 6000 3D Marks in 3D Mark 2005, but the 6800GT SLI setup scored almost 9000. Again, at higher resolutions with 4xAA enabled, the 6600GT-SLI setup did not fare well. I got an out of error message at 1280x960 with 4xAA turned on. I did not even bother testing these cards at 1600x1200 with 3D Mark 2005. Next I compared the two SLI setups in Aquamark3, a benchmark which is getting a little old now, but still gives some good data. At lower resolutions, both cards maxed Aquamark3 out, but at higher resolutions, with 4xAA enabled, the 6800 cards edged the 6600GT cards out. Finally, I wanted to look at overclocking the two SLI setups using Powerstrip (Entech). I compared the results in 3D Mark 2003 and 2005. First up, I tried overclocking the core and memory on the 6600GT cards (default values = 520MHz core, and 1100MHz DDR3 memory). At default values, the cards turn in a score near 15,000. Boosting the core from 520MHz to 531MHz increased the score by almost 200 points, and another 10MHz boost raised the score to around 15,300 3D Marks. In general, increased core speeds gave larger performance boosts than increased memory speeds. In all, I was able to overclock the 6600GT SLI setup to 550/1152 without any problems. This gave me an approximately 5% boost in speed, which is nice, but no big deal. When I tried overclocking the 6800GT SLI setup I was surprised to find that it had been very conservatively clocked by Asus. The default values are 350 core and 1000 memory. Performance increases in 3D Mark 2003 and 2005 are shown below. Again, core speed boosts provided larger increases in benchmark scores than boosts in memory speed. I was able to get the cards to 400MHz core/1099 memory, without any problems in stability or image quality. This boosted the score in 3D Mark 2003 from around 19,250 to around 21,200 (~10%), and from about 8900 to about 9810 in 3D Mark 2005 (~10%). A 10% boost in speed without stability problems is a nice addition to this overall excellent graphics platform. I would be remiss not to point out that current drivers do not permit dual monitor output with an NVidia SLI setup, but that is supposed to be corrected with future driver releases. In conclusion I can say that NVidia's SLI solution at the high end of the line is the fastest 3D gaming solution on the market by a significant margin. However, it is expensive and has definite drawbacks, including the lack of dual-monitor support and a limited degree of expandability on dual PCI-e motherboards, which usually have only 2 or 3 additional PCI slots for SCSI, sound and video capture cards. As far as gaming is concerned, I've been playing games for several days each with the 6800GT and 6600GT SLI setups, and both had great performance at 1024x768x32 without any antialiasing. The 6600GT card did not do well with AA on, or at high resolutions. However, the 6800GT-SLI setup pretty much takes whatever I throw at it, and delivers exceptional image quality. Games like Half-Life 2 run fantastically at 1280x960 with all options set to high. Gameplay is seamless. If I throw in 4x AA I still get excellent performance, but with the occasional hiccup when entering new areas. Games that gave my AGP 6800-Ultra card a hard time at 1280x960 would play without hesitation using the 6800GT-SLI setup. NVidia has come up with an expensive, but very powerful 3D graphics solution in their GeForce SLI lineup. After spending a lot of time with the 6600GT-SLI setup I can say it is not a particularly good option for high resolution gaming, which in part defeats the purpose of having a fast gaming system. The lack of dedicated onboard memory, and the reduced bandwidth end up hurting these cards significantly when they are asked to move large amounts of data. In contrast, the exceptional bandwidth and parallel processing power of the 6800GT setup was impressive under heavy load. The new NVidia drivers will let you observe the load balance between the two cards, which is pretty cool, but for the most part the load stays very balanced during gameplay so I'm not sure how informative the utility is. I am having a great time playing games on the 6800-SLI setup like Half Life 2, Brothers in Arms and other new games, and I'm really looking forward to Battlefield 2 which should be out any day now. This is as good as you can do now in PC gaming graphics, but that doesn't mean that things aren't going to change quickly. NVidia has new cards about ready to go, and ATI has new SLI-capable cards coming in a few months. So the bottom line is that SLI will only get better and cheaper over the next 6 months as the competition heats up, so waiting, as always, is a good idea. DVI connector requires adaptor for CRT monitor that may be partly blocked in some PC enclosures. Not enough DDR3 memory for high resolution gaming.